It is said that when Ādi Śaṅkara was a young boy of eight and wandering near River Narmada, seeking to find his guru, he encountered the seer Govinda Bhagavatpada who asked him, "Who are you?". 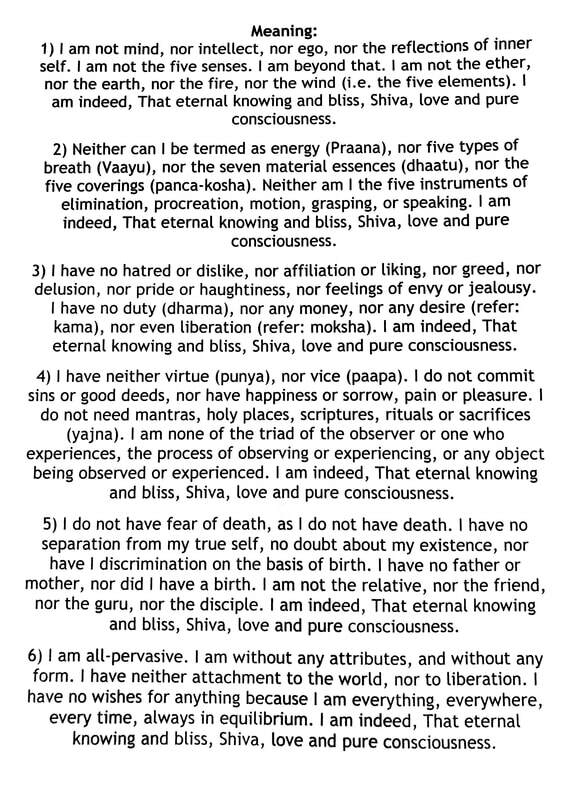 The boy answered with these stanzas, which are known as "Nirvāṇa Ṣaṭkam" or Ātma Ṣaṭkam". Swami Govindapada accepted Ādi Śaṅkara as his disciple. The verses are said to be valued to progress in contemplation practices that lead to Self-Realization. It is interesting to note that Ādi Śankara was known to be a non-dualist, and yet He wrote many of the devotional hymns that are still chanted and sung today in temples. This alone seems to get rid of all of the conflicts of tantric/dvaita (dual) and advaitic (non-dual) practices for they go hand-in-hand. If not, the resistance of boths paths towards each other would eliminate their total usefulness. Just a few of His other works that indicate the promulgation of the dvaitic/tantric/dual path are: Annapurna Stotram, Ganga Stotram, Ganesha Panchratnam, Lalita Panchakam, Shiva Manas Puja, and many, many more. 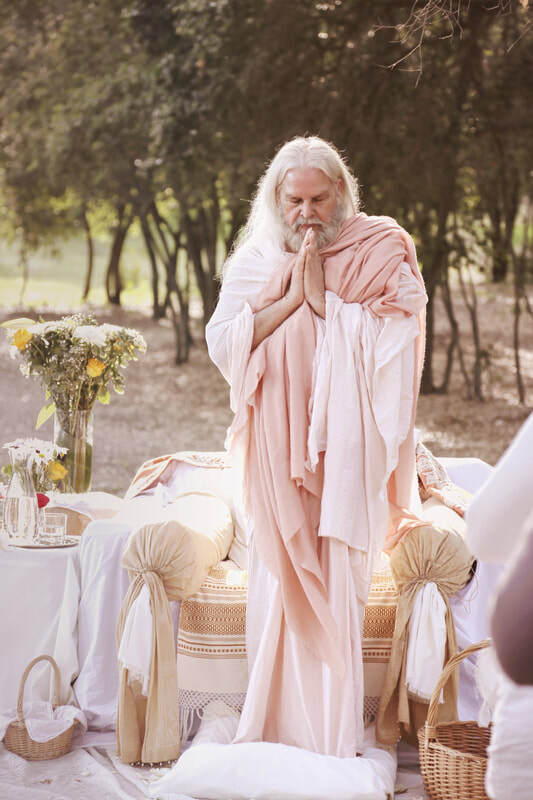 What is truly fascinating is that while this mantra speaks of there being "no guru, no disciple", it is a fact that without the Presence, Grace, and Energy of the SatGuru, and their Personal Beingness, that one never comes into contact with such energized teachings of the Advaita Vedanta (nondual). A spiritual aspirant may come into contact with such non-dual teachings nowadays because of it being so readily available on the internet, but these are unfortunately un-Energized. More unfortunate than this, people do not even know of this and yet they take the mantra, teachings, and practices they have found to be of the Highest, unfortunately thinking they are connecting with the Ultimate. It is one of the biggest issues in the "spiritual world." Non-dual or Advaitic teachings are considered a contemplative practice. It is not something you can apply practically. For instance, you may say there is no one to do anything and nothing to be done, yet you will still need to do things because things need to get done. And there may not be in actuality an individual as such, but until one has had Full Realization and become an "irrevocably Enlightened Buddha," there is still "someone left" that needs to obey the ritual of actions and identify with the way things are experienced from a limited sense of locality. As confusing as this may sound, it is possible for the sense of self to have one part of its identification be at the lowest level of identification with the more contracted body sense and unregulated, negative aspects of psyche, whilst the higher functional part of being that can identify with that which is beyond all limited parts of being. Its almost like until the full transition has been made, one straddles the two hemispheres of reality/Reality. It is interesting that when True Enlightened Masters recall their Guru, they often shed tears of love, gratitude, and the utmost devotion when expressing the miracle of their Guru. For they know that without their Guru the likelihood of enlightenment is far removed as they struggle to figure things out in the darkness of their own ignorance. The Guru, meaning "one who takes one from darkness to light," literally has one job description, to bring any soul who is deeply committed and interested out of and through their own ignorance (darkness) and into the Truth (Light). When this happens, the curse of "endarkenment" (ego) is lifted, and enlightenment ensues. To this Magical Divine Force and Power manifested by the Universe we bow, Om Shri Gurave Namaha. The Guru is the exception of the rule of duality because there is no ego there and therefore no duality. What looks dual, like the body, gender, and personality, are just the tools that the Guru uses upon which our flow of consciousness can attune to until there is complete dissolution of our ego. If the Guru transcended the ego, or has never had an ego, depending upon the type of Guru, then when the aspirant focuses upon the Guru, the focus doesn't land anywhere, for there is no object or ego for it to land on. Instead, the flow of consciousness actually returns back to the Source. The entire path is to get our consciousness to go back to or to recognize its Source. Interestingly enough, when the spiritual aspirant focuses upon the externalized form of the Guru, their consciousness is actually returning back to its Source. Guru = Source (of Consciousness). 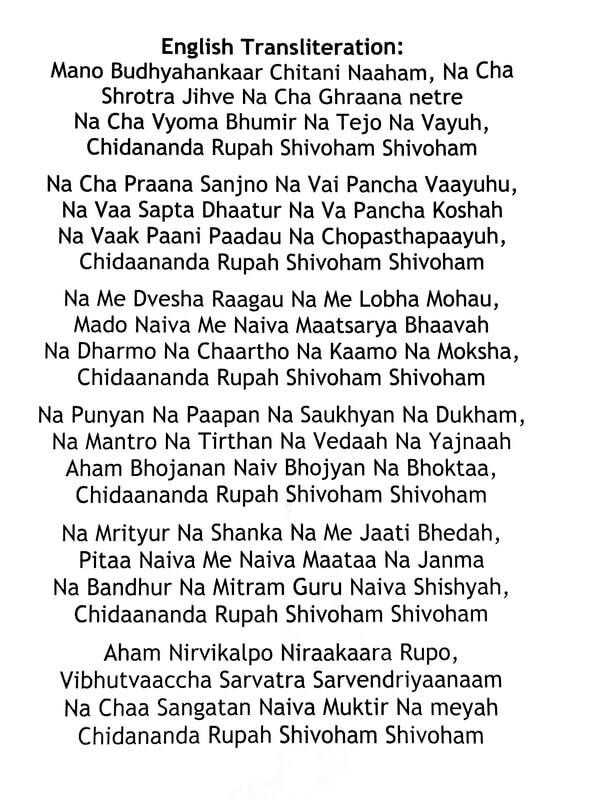 Shatakam mantra for the Initiation.